This sculpture is hung at the Duke Energy headquarters in Raleigh, North Carolina. It represents the six river systems that are the focus of restoration and preservation efforts funded by the Duke Energy Water Resources Fund. 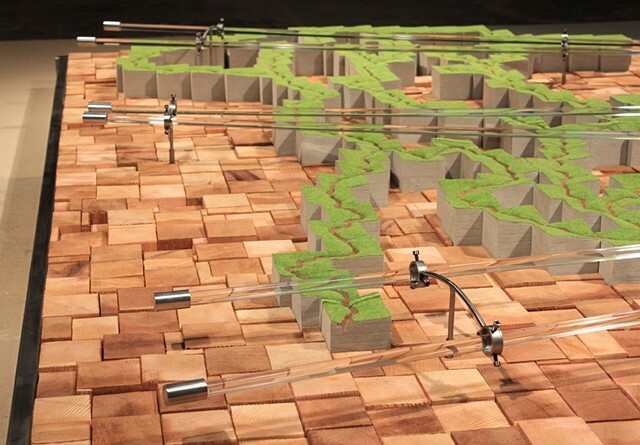 This sculpture is composed of 150 homasote blocks modeled to illustrate the topography of each river system represented. The carved riverbeds are surfaced with soil collected from the banks of each waterway and the composition is bisected by acrylic tubing filled with water samples also collected at each river. The amalgamated river system is set against a field of rough hewn cedar blocks and is framed with steel bars.